Extraordinary Dogs: Having a dog in bed with you may help you sleep better! 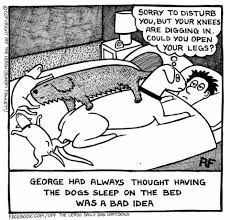 Having a dog in bed with you may help you sleep better! Mayo Clinic Sleep study discovered nearly half of pet owners reported they felt more rested with their animal in their bedroom than without! How well does the pet owner sleep? How well does the bed partner sleep? Is the pet free of fleas, dirt, burrs, etc.? How large is the bedroom; the bed? Does the pet sleep soundly? Does the pet sleep on the bed and, if so, where on the bed? Does excluding the pet from the bedroom work (or is the pet making noise for attention)? Does the pet have any special needs (medications, voiding) requiring attention at night? Does the pet enhance a sense of security? Does the presence of the pet aid relaxation? Data was collected by questionnaire and interview from 150 consecutive patients seen at the Center for Sleep Medicine, Mayo Clinic in Arizona. 31 (41% of pet owners) having multiple pets. More than 50% pet owners (56%) allowed their pets to sleep in the bedroom. 31 pet owners (41%) perceived their pets as unobtrusive or even beneficial to sleep. Health care professionals working with patients with sleep concerns should inquire about the presence of companion animals in the sleep environment to help them find solutions and optimize their sleep. Source: 2015 Mayo Foundation for Medical Education & Research 2015;90(12):1663-1665; Center for Sleep Medicine, Mayo Clinic, Scottsdale, AZ. I was checking constantly this weblog and that i’m impressed! Very beneficial data particularly the final part. custom dissertation writing service I take care of such information tons. i was searching out this precise info for a very long term. thank you and desirable good fortune. I'm not sure that this is a good idea to let you dog sleep with you every time. First of all we don't need to forget about subordination and the control. If a dog will realize that she can do whatever she wants you will be dethroned from a position of a master and even essay site watch won't help you. Secondly we need to remember about hygiene and our health. It's better to sleep i a clean bed without street dust.